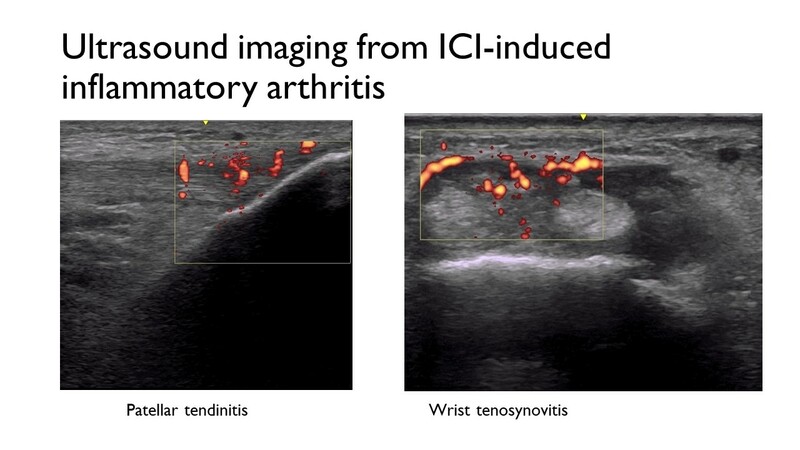 The Doppler signal in these ultrasound images shows increased blood flow in the knee (left) and wrist (right), indicating inflammation. Patients with advanced-stage cancer have few options, and each comes with a laundry list of possible side effects for which there are widely varying probabilities of occurring. Somehow, they have to find a calculus that helps them choose which road to take. So, when they experience a side effect that wasn’t on the map, they can feel lost and scared. Also, it can take months for a diagnosis to be made and treatment to begin. Johns Hopkins rheumatologist Laura Cappelli is shedding light on experiences like these among patients who develop inflammatory arthritis (IA) due to immune checkpoint inhibitor (ICI) therapies. The joint pain and stiffness typical of inflammatory arthritis are caused by immune system activity that results in swelling and irritation of joints and their surrounding soft tissues. For many patients, IA results from an autoimmune disease, as is the case with rheumatoid arthritis, but the exact underlying molecular mechanisms are unknown, says Cappelli. 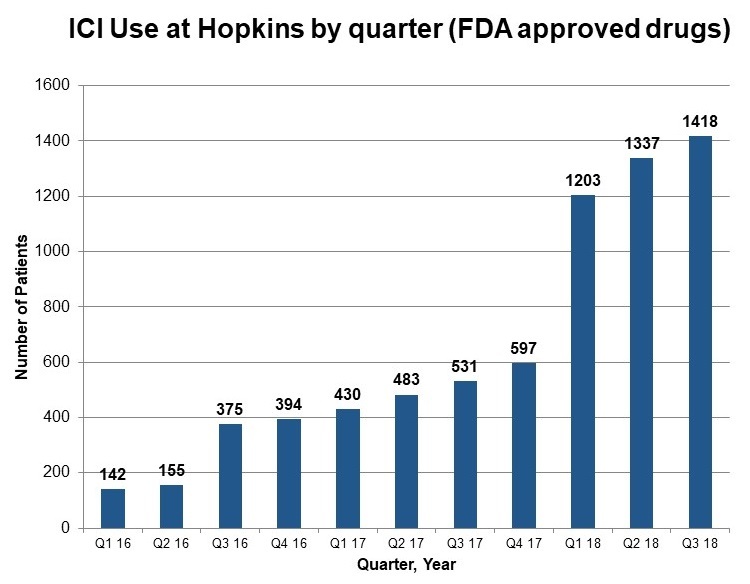 The number of patients treated with immune checkpoint inhibitors at The Johns Hopkins Hospital has increased tenfold in less than three years. Some patients develop IA after being treated with ICIs. Cappelli explains that ICIs block the negative regulators of T-cell activation, boosting a patient’s immune response to cancer cells by “taking the brakes away.” The ICIs currently in use (ipilimumab, pembrolizumab, atezolizumab, avelumab, durvalumab, cemiplimab and nivolumab) have been found most effective against melanoma, renal cell carcinoma, certain types of lung cancer, and cancers with a propensity for genetic mutations. Hundreds of thousands of patients with advanced-stage cancers are given ICIs each year in the U.S., and an estimated 5 to 7 percent of them develop IA. Preliminary work from Cappelli and colleagues suggests genetics as a factor in its etiology, as in the case of rheumatoid arthritis. Like other forms of arthritis, inflammatory arthritis due to ICIs can have a serious impact on the life of patients — physically, emotionally and socially. Its effects on joint mobility can leave them unable to perform everyday activities, including those required by their jobs and those they greatly enjoy, like getting down on the ground to play with children or grandchildren. To better understand the experience of patients with ICI-induced IA, Cappelli and her colleagues performed a qualitative study, interviewing 10 patients ages 36 to 73. Many of the participants mentioned that, relative to other ICI side effects, their IA was a prominent one because of its persistence and impact on daily life. They also mentioned the absence of IA in patient information handouts, and they noted receiving less social support for their arthritis compared to their cancer. Among the 10 patients interviewed, half were diagnosed within one to three months of symptom onset, but two patients were diagnosed more than a year after symptoms began. There was also variation in when symptoms began relative to the start of ICI treatment, with a range of two to 16 months.